uyahoga Valley Scenic Railroad (CVSR) has partnered with nonprofit organizations and schools in northeast Ohio to provide THE POLAR EXPRESS™ train ride experience for underserved children and families. CVSR will host THE POLAR EXPRESS™, presented by Countertop Solutions, for underserved families in Northeast Ohio on December 8th at 10:00 a.m. 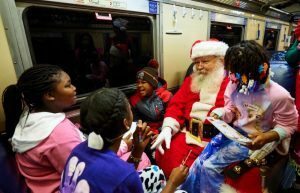 The annual POLAR EXPRESS™ ‘Charity Train’ ride enables more than 1,100 children and families to experience the magic of the holiday season aboard a trip to the North Pole, free of cost. Each year, CVSR partners with local schools, nonprofits and other organizations, to distribute tickets to families in their network. THE POLAR EXPRESS™ charity program is a small way for CVSR to give back to the community and enable children and families in need the chance to experience the popular Christmas train ride.